Dark spots can appear for various reasons. If you're suffering from this, here are some natural remedies that may reduce the appearance of the dark spots on your face. Dark spots are very common because they can appear for various reasons. The good news is that you can use homemade and natural alternative creams for the dark spots on your face. There are many alterations in color uniformity of the dermis. These can be white, brown, pink, red, etc. The darker they are, the more problems they cause. These spots are caused by an excess of natural pigment (melanin) because of a greater amount of cells. One of the most common causes is sun exposure, which causes transitory or permanent spots. The most frequent shape of face spots (or spots on any part of your skin) are moles, ephelides or freckles, and lentigines. Although they’re not harmful to your health, many people decide to get rid of them because they want to look better. Protect yourself from the sun, especially at midday during the summer. Don’t expose yourself without using a high SPF sunscreen. Wear a hat and sunglasses. Have a healthy and balanced diet. Eat plenty of fruits and vegetables. Don’t forget to include fish and walnuts, two very good foods for your skin. Drink at least 6 glasses of water a day to keep your skin and your body well hydrated. Wash your face and moisturize it everyday. Before going to bed, remove your makeup and wash your face with warm water. In the morning, use a good moisturizer and take advantage of natural remedies. Apple cider vinegar: Soak a cotton ball in apple cider vinegar and apply it to your skin every day. Leave on for 20 minutes and wash with plenty of water. 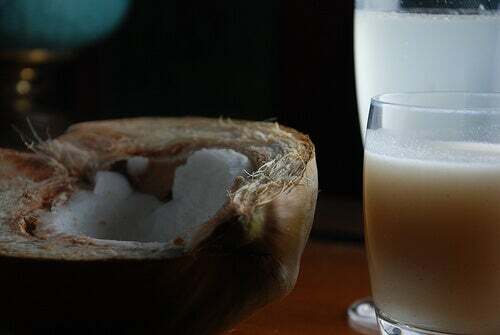 Coconut cream: Coconut milk is also very useful. Apply it every night and leave on until the next day. 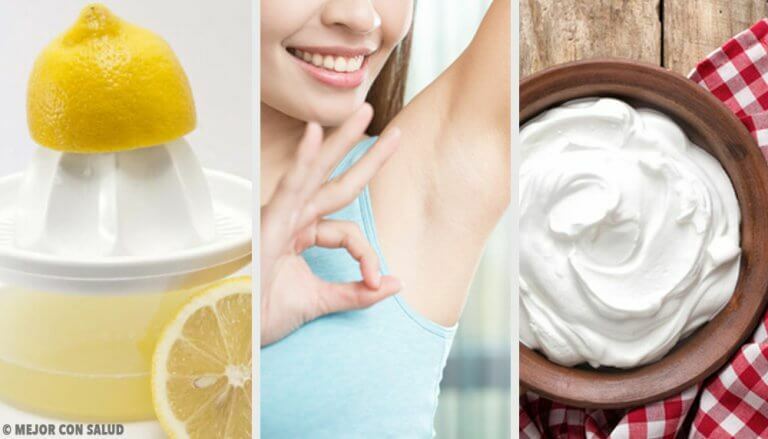 Lemon juice: This is the most popular home remedy for dark spots. However, you should be very careful when applyin it. Also, you should always apply it at night or if you’re not going to leave the house. This is because, when lemon comes in contact with the sun, it can cause spots. Olive oil: It must be extra virgin (the purest that exists). Apply a little bit to your face with a cotton ball. Leave on until it dries and remove with hot water. Onion: This is another amazing remedy for dark spots due to the nutrients that its juice has. Use it topically to conceal wrinkles, acne, etc. Leave on for 10 minutes and then wash with cold water. If your skin is very sensitive, it will burn a little. If that happens, remove as soon as possible. Milk: This ingredient has been used for thousands of years to smooth the skin. Lactic acid removes all dead skin cells and it also whitens it to restore its brightness. Yogurt: You can also take advantage of yogurt’s benefits. Apply it to your face with a gentle massage and let it dry. Then, rinse well with warm water. Cucumber: It has a lot of water, vitamin E, natural oils, and many nutrients that help restore the dermis’ vitality and reduce the appearance of dark spots and wrinkles. Cut it into slices and make a homogenous paste. Apply it to your face for ten minutes and rinse. 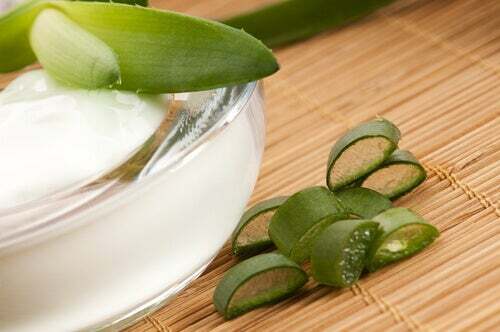 Aloe vera: Another indispensable beauty product. It helps nourish and smooth the skin. Cut an aloe vera leaf and remove the gel. Apply it on the areas with spots and leave on for 30 minutes. Tomato: Tomato juice has many nutrients, including vitamins C and A and proteins, that help reduce the multiplication of free radicals. Cut half a tomato and apply it to your face. It’s an excellent remedy for sunburns. Turmeric powder: It’s an amazing ingredient to help reduce the appearance of dark spots. Massage it into your face with a little bit of water or lemon juice. Leave on for 30 minutes and then rinse. Hydrogen peroxide: This is a truly incredible whitener. At night, soak a cotton ball in hydrogen peroxide and gently massage it into your skin. Apply it every day for two weeks. Chamomile: Chamomile tea can be used as an astringent or toner to help clear your skin up. You should use it to do a deep facial cleanse. Just make normal chamomile tea, let sit, and then soak a cotton ball in the cup. Apply it to your face. You don’t have to rinse it off, just let it dry. Images courtesy of Shannon Kringen, Kristen Taylor, Daniel R. Blume, ER and Jenny, and Eddi.